In this 5th and last part of his article on the character and weapons of the Ryūkyū Kingdom, Nakahara discusses early karate and kobudō sources from the kingdom time. Although quite short, still today no earlier written usage of the term tōdī (karate) has been identified than that used in the 1867 martial arts program of the Kume Village School. However, it is simply a composite word and although referring to a pre-karate-like martial art, and although related to it, it has to be viewed in its thematic relevance. It cannot be ruled out that the term was later simply re-chosen due to its historical significance, and maybe it was later even changed due to its historical implications, i.e. of Chinese heritage, and specifically due to its unequivocal connection to Kume only. It might even have been coincidence. A homonymous term can simply have many meanings, especially when used in specialized terminology in contrast to common language. It was Arakaki Seishō who performed martial arts at the said martial arts demonstration of 1867, in front of the Chinese investiture envoys at the royal tea villa (Ochaya-udun) in Shuri Sakiyama. In the rank of a Tsūji Pēchin at the time, Arakaki Seishō performed Sēsan, Shisōshin, Bō vs. Tōdī, Tinbē vs. Bō, as well as and unarmed hand-to-hand fighting called Jiaoshou. And this martial arts presentation was a part of the festival of school arts hosted by the Kume village school. The fact remains that the sole written proof for the use of the term tōdī – and besides actual kata names of “Naha-te” – during kingdom times refers to this martial art of Kume village, and nothing else. Another fact that remains is that there is no proof for the use of tī that even comes close to 1879. Quite on the contrary. Though it can be used to validate basically any technical content that people wish for, it was and still is nothing but a 20th century working theory. Cut my flesh, but I cut your bone. But hitherto I didn’t come across even one watertight reasoning by anyone that was able to proof the existence of tī in the above sense and under this name. Therefore, at least for me, both perspectives are likewise possible. Since decades following the 1867 demonstration the terms “Shuri-te”, “Tomari-te”, and “Naha-te” were used, it was stated “Naha-te” is younger because tī existed. I repeat: there is no evidence for this, quite on the contrary. All over the tip of the iceberg known as the internet, confessions of belief are spread by the various supporting groups, relying exactly on this fallacy. As regards Kūsankū: who can tell if there was an actual personal tradition of a kata by the same name since the coming of this person in 1756? Here again it is impossible to exclude the possibility that the name was simply chosen as a retrospective reference to a historical incident related to the import of martial arts. Fact is: Kūsankū in the meaning of a kata was nowhere mentioned during kingdom times; only in retrospective reference. The ONLY reference to kata demonstration during kingdom times refers to the 1867 demonstration of the Kume school. Saying that something is true because it is possible is a very bad choice, simply because it always, forever, and concurrently allows for the complete opposite opinion. This is true for martial arts history. Be that as it may: don’t get me wrong! You can still count me among the greatest fans of Okinawan martial arts. I am just allergic against quibbling “in the name of…”. And yes, from the extant sources we can also indirectly derive the existence of other Okinawan martial arts. It’s a question of primary and secondary sources. But primary sources have the lead. Entry on Kusanku in an edition of the Oshima Hikki. And then, fifty years later, Basil Hall’s “Account of a Voyage of Discovery to The West Coast etc.” (1816) contained a similar account. Shinkōsen – i.e. Ryūkyūan ships for paying tribute to China – were equipped with cannons (ishibiya), rifles, spears, long swords, and bows and arrows, and it is questionable that these skills just suddenly have been acquired by the Okinawans. In addition, when it comes to the Chinese investiture envoys (sappōshi) to Ryūkyū: the first of their ships was equipped with 5 big sized cannons, 29 small and medium sized cannons, 30 rifles, 20 bamboo spears, and 60 suits of armor; their second ship was equipped with 3 big sized cannons, 20 small and medium sized cannons, 30 rifles, 20 bamboo spears, 20 swords, 40 suits of armor, 40 shields and others. During the festivities of King Shō Tai’s investiture in 1866, in the program of the school arts festival held by the Kume Village School, among the 47 program items we find 9 items sporting 5 different martial arts. These five are tōdī, tesshaku, bō, tengpai, and kuruma-bō. Apart from tōdī (karate), the tengpai had also been imported from China and was among the weaponry found in the above-mentioned list of the second sappōshi ship. It was a defensive armament like a shield. The kuruma-bō originally was a farming implement for striking wheat or beans and the bō seems to be an original weapon of Okinawa. The Japanese name of the kuruma-bō is karasao, from which one can see an import from Japan. On the tesshaku I don’t know at all what to say. Apart from the bō, the chikusaji and chikudun also used bamboo spears, with the prefix chiku used in their title seems to originally have come from bamboo (take 竹–> chiku). Once again considering the history of arms in Ryūkyū, it should have become sufficiently clear that neither King Shō Shin nor later the house of Shimazu confiscated cut and thrust weapons and other arms, and furthermore, as regards the development of karate and musical entertainment, that there was no direct relation between them of whatever sort. Tesshaku 鉄尺 is read as tiechi in Chinese. Tie literally translates as “iron,” it can, however, also be interpreted as “weapon.” Chi translated as “ruler” or “an instrument in the form of a ruler.” This refers to an iron weapon of an elongated form, possibly originally with a rectangular cross section. In fact these are what became called sai in Okinawa. karabutsu 唐物: Goods from China; imported goods. 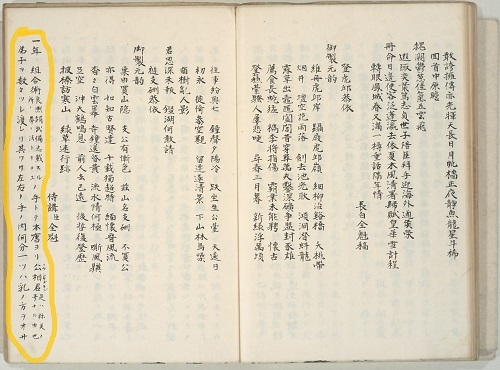 tōshi 唐詩: Chinese poetry of the Tang Dynasty. This entry was posted in Unknown Ryukyu and tagged Character and Weapons of the Ryukyu Kingdom, chikusaji, Karate, King Sho Shin, Kumiai-jutsu, kuruma-bo, Kusanku, Nakahara Zenshu, oshima hikki, sapposhi, Shimazu, tengpai, tesshaku. Bookmark the permalink.